All Lakes Region entrepreneurs, business owners, local government officials and the general public are invited to participate in the 2019 Legislative Forum sponsored by the Sebago Lakes Region Chamber of Commerce (SLRCC) and Lakes Region Delegates to be held this Saturday, March 30 from 10 a.m. to noon at the Alfond Center on the Saint Joseph’s College of Maine Campus, 278 Whites Bridge Road in Standish. 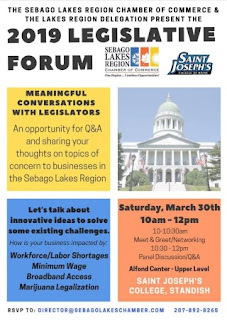 Among possible topics and discussion items that may impact local businesses include, but are not limited to, workforce and labor shortages, minimum wage, broadband access and marijuana legalization. “We have invited all delegates from across the Lakes Region to participate in this forum,” Mansfield said. “The legislative panel will include Susan Austin (R), Mark Bryant (D), Patrick Corey (R), Jessica Fay (D), Bill Diamond (D) and Walter Riseman (I). The morning will begin with a meet and greet style of networking at 10 a.m. that will include coffee and pastries. This will be followed by the panel discussion and question/answer session from 10:30 a.m. to noon. To RSVP to the event, contact Mansfield at director@sebagolakeschamber.com or 207-892-8265. If you are just learning about this event and aren’t able to register, feel free to join the event anyway. Those who wish to be included in future announcements such as these, should follow the Sebago Lakes Region Chamber of Commerce on Facebook or sign up for their e-newsletter on the homepage of their website: www.SebagoLakesChamber.com.